Theresa May defended last week's draft agreement for leaving the EU and said there was a "critical" week ahead. There has been widespread criticism of the 585-page withdrawal agreement - published alongside a far shorter document setting out what the UK and EU's future relationship could look like - which is set be signed off at a special summit next week. There is also doubt over whether it can win the approval of the House of Commons, with opposition parties - including Northern Ireland's Democratic Unionist Party - opposing it. Some cabinet ministers have resigned, including Raab, and others are believed to be still trying to change its wording. The key Brexiteer group of Tory MPs has published its rebuttal of the draft plan - saying it will make the UK a "rule-taker"
Theresa May told Sky News's Ridge on Sunday it had been a "tough week" but that she would not be distracted. "Politics is a tough business and I've been in it for a long time," she said, adding that the next seven days "are going to be critical" for the future of the UK. 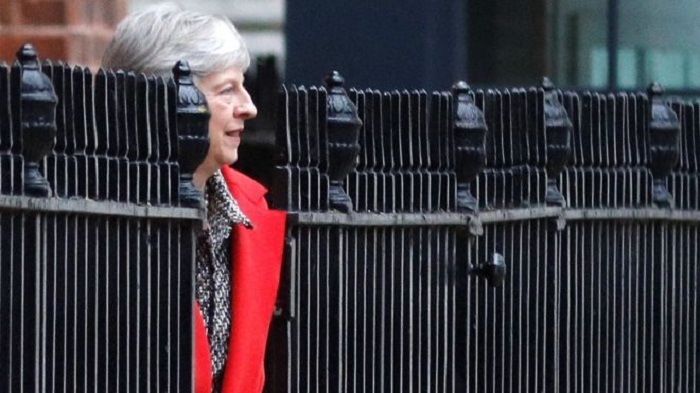 Theresa May said negotiations were still taking place to put more detail into the future deal proposals, saying it was this part that "delivers on the Brexit vote". The European Commission says Theresa May will only meet Jean-Claude Juncker when concrete progress has been made on the content of the political declaration document on the future relationship between the EU and the UK. Those negotiations have been going on this weekend and had been expected to conclude on Tuesday - let's see. EU sources are clearly spelling out that the PM's visit would be to finalise this political declaration - and not to re-open the withdrawal deal approved last week by the cabinet. Don't forget - the withdrawal agreement will be legally binding. The political declaration on the future will not. It can be altered after Brexit, because it is only then that the detailed EU-UK negotiations on a future trade deal begin in earnest. And according to a note of the meeting, the EU has proposed 31 December 2022 as the ultimate end date for a possible extension to the transition period. The draft withdrawal agreement includes the option of extending it if more time is needed to reach a trade deal - but rather than specifying an end date, says a decision may be taken "extending the transition period up to [31 December 20XX]." Also in the meeting with diplomats, there were concerns raised about the long-term future partnership between the UK and the EU, the detail of which has yet to be finalised. There was a divide between member states that want an ambitious trading relationship with the UK and those who want Britain's access to the single market to be more constrained, BBC Brussels correspondent Adam Fleming said. The UK wants to maintain the status quo on internal security, which is also "a problem," ambassadors were told. A diplomat said the message from the EU's Brexit negotiators to the member states was: "Keep a lid on your concerns for now and we'll deal with them in the negotiations on the future relationship." Sir Graham told BBC Radio 5 Live's Pienaar's Politics he would not reveal how many letters he had received - saying he had not even told his wife, who is his parliamentary assistant. "I get asked in the supermarket, in the street," he said. Sir Graham said he found the suggestion he had received 48 letters but not acted on it to be "slightly offensive". "It's critical that people trust my integrity in this," he said. Sir Graham also told the BBC's Sunday Politics North West it was "very likely" Theresa May would win a vote of no-confidence if there was one. It is difficult to see how the 25 November EU summit could go ahead if Theresa May were to lose a confidence vote in the next few days. It is up to Sir Graham to decide when such a vote would be held, once he has received the required 48 letters from Tory MPs demanding one, but he has said the process will move quickly. If Theresa May were to lose that confidence vote it would spark a leadership election but she would not be allowed to take part in it. She would remain prime minister until the contest was over unless she opted to resign and hand over to a caretaker prime minister. Raab, who negotiated for the UK with the EU's Michel Barnier, has been explaining his decision to quit on the BBC's Andrew Marr show. With "two or three points" being changed he could support the government's proposals, he said. He said he did not know who had inserted a clause on customs relations into the future partnership document but said it was a "clear breach" of the Conservative manifesto. "The difficulty for me is that I was being asked to go over to Brussels and sign on the bottom line... on a deal which I said in good conscience I did not feel was right for the country," he said. "I do think we are being bullied, I do think we are being subjected to what is pretty close to blackmail frankly. "I do think there is a point at which, we probably should have done it before, where we just say 'I'm sorry this is the United Kingdom of Great Britain and Northern Ireland, we cannot accept those dictated terms'." The draft document sets out the terms of the UK's departure, including details such as how much money will be paid to the EU, details of the transition period and citizens' rights. Both the UK and the EU want to avoid a hard Northern Ireland border so they agreed to include in the deal a "backstop" - or back-up plan - in case they cannot reach a long-term trade agreement which does this. And the UK would not be able to leave the backstop without the EU's consent. Tory MP Zac Goldsmith, the party's London mayoral candidate in 2016, has sent a letter. Writing in the Sunday Telegraph, the Brexiteer said that under the PM's plan "in effect, Britain would remain in the EU, but without having any say". He added: "Had that been the choice, I personally would have voted to remain." What would Labour do about it all? Labour leader Corbyn says his party, which has 257 MPs, will not support the deal. He told Ridge on Sunday the "one-way agreement" on Northern Ireland was "not acceptable", and there were no guarantees on workers' rights and environmental protections. If it was voted down in the Commons, he said the government should go back to the EU and "renegotiate, rapidly". Corbyn insisted Labour would be able to negotiate a better deal, even within the time remaining before Brexit, saying the proposed transition period - which will only happen if there is a withdrawal agreement - offered "some opportunities" for this. He also said another referendum - as demanded by some of his MPs - was "an option for the future but not an option for today". He said he voted Remain in the 2016 referendum but if there were to be another, he said: "I don't know how I would vote - what the options would be at that time."